As a member of the EU, Malta has to calculate its national debt following a set of rules that are specified in the Maastricht Treaty. This formula counts the debts of all levels of government and must include guarantees and obligations made to EU institutions. However, the country does not have to include guarantees given for loans to other organizations within its border. The country also doesn’t have to include obligations to pay pensioners in the future. Malta’s financial data is recorded by Eurostat. The country is also tracked by the IMF. The rules that the IMF follows in order to calculate national debt are a little different to those used by Eurostat and the government of Malta. For example, IMF does not include those EU institution obligations. An example of an EU expense that is counted by Eurostat and not included by the IMF are guarantees that underwrite the activities of the European Financial Stability Fund. Another difference between the calculations of Eurostat and the IMF is the way each values outstanding government securities. The European rules take the face value of government debt instruments. After all, this is the amount of money that the government of Malta will have to pay on the maturity date of those bonds and bills. The IMF values those instruments at their market value, which in come cases can be considerably higher than their face value. Depending on the difference between the face value and the market value of debt instruments and the size of a country’s share of guarantees to European institutions, the difference between Eurostat figures and IMF calculations can be considerable. The total of all general government debt is termed the “gross debt” of Malta. The IMF also calculates a net debt figure for each of the countries that it monitors. Net debt is the gross debt minus all of the financial assets that the government holds. Assets such as buildings, armaments, and art works are not included in this asset value. At the end of 2017, Malta’s net debt to GDP ratio, according to the IMF, was 40.5%.This means that the government of Malta could pay off almost a third of the national debt if it sold off all of its financial assets. Is Malta’s national debt growing? The Republic of Malta joined the European Union in 2004. A requirement of member states is that their governments should not let their annual budget deficits be larger than 3% of GDP and the national debt should be below 60% of GDP. 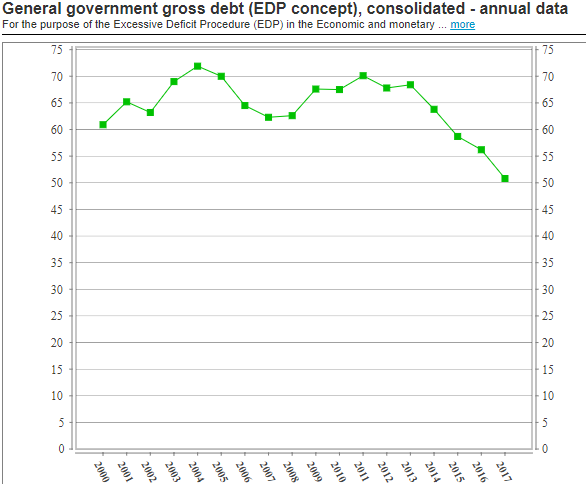 The graph below shows the Eurostat calculations of Malta’s debt to GDP ratio so far this century. Eurostat calculated the debt to GDP ratio for Malta was 71.9% in 2004. This is too high, and so the country started to reduce its debt over the following years. The government also struggled in those early years to get its deficit down to 3%. Before the country managed to comply with Maastricht debt requirements, the 2008 financial crisis occured and reflating the economy took priority over complying with Maastricht Treaty debt requirements. 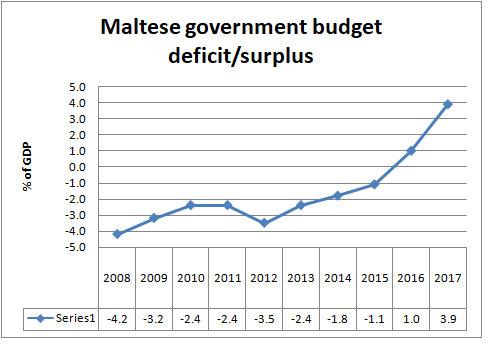 Since 2013, the Maltese government has managed to control its budget deficits, year by year, getting it to a surplus. A sharp improvement in the country’s rate of economic growth since 2012 also helped the government of Malta work towards its Maastricht debt targets. The government deficit has been lower than 3% since 2013 and actually a surplus since 2016. The country’s debt to GDP ratio has been below 60% since 2015 and it continues to fall. What is Malta’s credit rating? The strong commitment of the government of Malta to keep the national debt under control is reflected in the ratings that credit ratings agencies have awarded to the country. In terms of national debt, it is the long-term rating that really matters. All of the major ratings agencies give Malta A-grade ratings. The top credit rating possible is “AAA.”However, getting up into the “A” bracket is a good achievement. Who manages Malta’s national debt? The parliament of the Republic of Malta has the ultimate authority over the country’s national debt the ruling party in the parliament also runs the administration of the government and the Ministry of Finance is responsible for setting the administration’s annual budget. Every budget has to be approved by the parliament and so by setting either a budget deficit or a surplus, the Ministry increases or decreases the national debt with parliament’s approval. The Ministry of Finance department that is specifically tasked with managing the national debt is the Treasury. The Central Bank of Malta has the task of actually selling debt instruments on behalf of the government. How does the Maltese government raise loans? The Republic of Malta is a very small country, which was once part of the British Empire. The country inherited standard judicial and financial procedures from Britain when it became independent. So, it runs its government finances in patterns that were well established in London. It is common practice for a government to auction off government securities to a limited group of approved bidders. This is traditionally known as the primary market. It is a way that governments transmit securities to the wider market with the primary dealers acting as market makers. The government of Malta would like to follow that format of creating a market for its securities. However, as the Central Bank reports, no commercial institute in Malta is interested in participating in the primary market. This is because the Maltese government very rarely issues debt instruments and so it isn’t worth the cost and the effort for any bank to set up a specialist Treasury division. The Central Bank of Malta, therefore, acts as an agent on behalf of the government of Malta and transmits its securities directly to the open market. What securities does the government of Malta sell? The government issues Treasury bills to cover short-term debt needs. These devices do not pay interest, but are sold at a discount and redeemed at full face value. The Maltese government Treasury bills with maturities of one month, three months, six months, nine months, and one year. Long-term financing for the government of Malta is carried out through a typical bond. These are called “Malta Government Stocks.” The Maltese government has issues fixed-rate MGSs and floating-rate MGSs. Of the Malta Government Stocks currently in circulation, 95.6% are fixed-rate instruments and 4.4% offer a floating-rate of interest. What facts should you know about Malta's national debt? You could wrap $1 bills around the Earth 30 times with the debt amount. If you lay $1 bills on top of each other they would make a pile 840 km, or 522 miles high. That's equivalent to 0.00 trips to the Moon.